Gov. Phil Bredesen addresses the audience at the Chattanooga Convention Center. MURFREESBORO - Former Gov. Phil Bredesen largely has avoided the partisan political arena since leaving office 20 months ago, but the Democrat is making an exception. At a fundraiser this week, Bredesen gave a endorsement of 4th Congressional District hopeful Eric Stewart, a state senator who is challenging U.S. Rep. Scott DesJarlais, R-Tenn., in the Nov. 6 election. "I think so highly of Eric that I've kind of semi come out of retirement here to come out and try to do anything I possibly can to help him in this campaign," Bredesen told attendees Tuesday in Murfreesboro. The former governor said Stewart, who was elected to the Senate in 2008, impressed him during his own final two years in office by his willingness to work out differences on tough issues while keeping constituents' needs in mind. 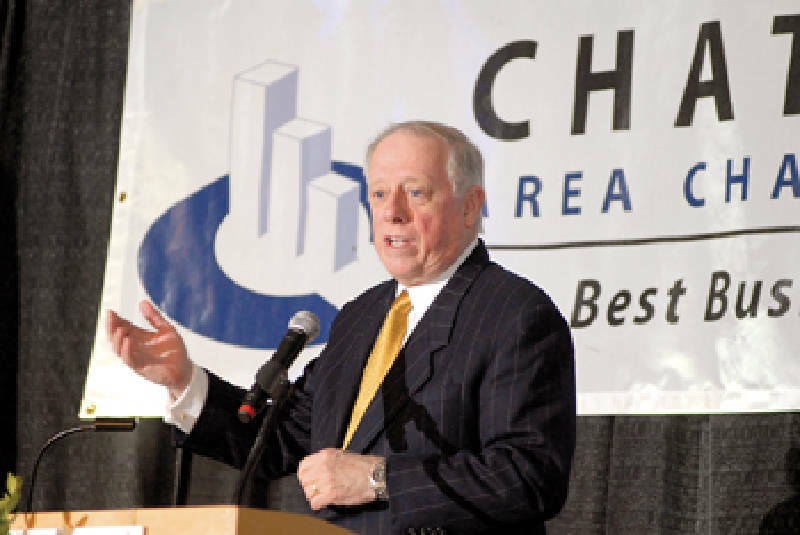 That's a quality increasingly lost in an increasingly rancorous Washington, said Bredesen. "One of the things I admire most of all about Eric is I think that he is someone who will go to ... Congress with an attitude of not [that] Congress is the problem or that Republicans are the problem or anything else," the former governor said. Stewart thanked Bredesen and said federal lawmakers on both sides of the aisle sometimes lack the "intestinal fortitude" to make necessary decisions. "Listen," he said, "I'm going to be an equal opportunity basher here. It's Democrats and Republicans both who are not willing to do that. We have folks in Washington [where] quite honestly one side is for something because the other side is against it and we're all the losers when that happens." DesJarlais campaign manager Brandon Lewis questioned Thursday whether Stewart is up to the task. He noted the candidate was hit with federal tax liens totaling $24,678. "It is hard to imagine with that kind of financial record that he could solve the complex fiscal problems that face our nation," Lewis added. Kevin Teets, Stewart's campaign manger, returned fire, saying "Congressman DesJarlais wants to talk about anything but his votes to betray working families, which is why he continues to raise this issue. Eric has met his obligations." Stewart resolved a $9,541.09 personal lien in 2003, Franklin County records show. He told the Times Free Press he "fell on tough times and fell behind" and is paying off the remaining tax debt on payroll taxes from a business that he sold in 2011. That lien was filed last year, and Teets said Stewart paid off the remaining amount owed on Monday and the lien was removed. A state Registry of Election Finance audit in 2010 questioned Stewart's 2008 campaign filings following a routine audit that made multiple critical findings, including lack of documentation on $22,000 of his total expenditures. Agency officials said Stewart later provided a list of expenses compatible with the types of campaign expenses he had made but had actual receipts for only some of them. The Daily News Journal in Murfreesboro reported the receipts accounted for some $1,500.